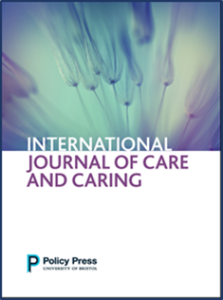 To celebrate its first year of publication, the International Journal of Care and Caring, a new journal of The Policy Press, in collaboration with the organisers of the 3rd Transforming Care conference, is offering a Best Paper Award for the paper, first presented at the Transforming Care conference, Milan, Italy, 26-28 June 2017, which, in the opinion of the awarding committee*, has the greatest potential for publication in an issue of the International Journal of Care and Caring Volume 2 (2018). All papers accepted for presentation at the conference will be eligible for consideration. To enter the competition, authors should forward their paper’s title and abstract to the IJCC at ijcc@sheffield.ac.uk before 15th July 2017, confirming their intention to make a full paper available for the awarding committee’s consideration by 15thOctober 2017. The committee will consider all applications received and the author(s) of the selected paper (or papers) will be notified of their decision by 15thNovember 2017. The Best Paper award will be confirmed only on acceptance of the full paper, following blind peer review, for publication in IJCC. Specific mention of their article in IJCC’s marketing and publicity in the year of the award, and in the relevant annual IJCC Editorial article. Research articles for IJCC should contribute to advances in knowledge, theory or methods within the remit of the journal. Articles based on comparative international analysis, critical analysis of policy or practice, or which explore care and caring in global or transnational perspective are particularly encouraged. Research articles published in IJCC are 4,000 to 8,000 words in length and double-blind peer reviewed prior to formal acceptance for publication. For more information, see the Instructions for Authors on the IJCC webpages. *The awarding committee will comprise: IJCC’s Editors [Sue Yeandle,Yueh-Ching Chou, Michael Fine and Joan Tronto] and, for the Transforming Care conference organising committee, Constanzo Ranci and Tine Rostgaard.